If you’re interested in taking belly dance classes with me (Jeana) and learning American Tribal Style® Belly Dance – the style that Indy Tribal performs – then you’ve probably figured out that we offer classes in different levels. Fear not, I’m here to help you understand why we divide the classes into levels, and what this means for you as a dance student. As you may know, ATS® is a unique dance form because it layers a vocabulary over the dance moves, letting us collectively improvise when we dance together. This happens by designating one dancer as the “leader,” and the other dancers (usually 1-3 at a time) follow her lead and do the moves that she cues. The leader can choose to give up the lead at any time, so that when a new dancer steps into the lead position, she then becomes the leader and is in charge of cuing new moves. Thinking in terms of language sets us up to expect classes to go at an appropriate pace, so Level 1 classes are where beginners can start, Level 2 classes are for intermediate dancers who know the Level 1 moves/concepts already, and Level 3 classes are for advanced dancers who’ve mastered the L1 and L2 moves. 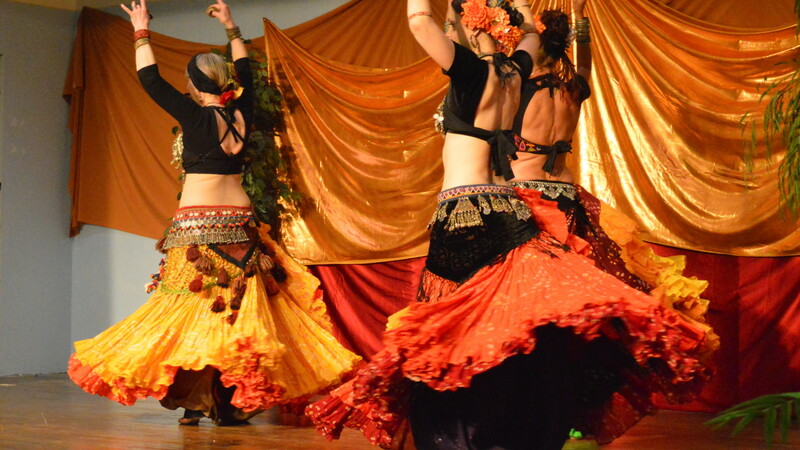 The language metaphor also helps us realize that we are essentially layering another set of meanings onto a physical movement form – which means that ATS® is even tougher than other kinds of belly dancing, since you’re not just responsible for executing dance moves competently, you’re also responsible for communicating about those moves while in the moment. This hopefully helps us be gentler on ourselves and understanding when mistakes happen, since this is really tough! Knowing that ATS® is a language reminds us that the dance form is a dialogue (since the point of language is to communicate). It’s not about being a star or a diva, it’s about being able to use your dance skills to have a conversation with other dancers. We all have to take baby-steps when we learn a new language, and ATS® is no different. I think it’s really important to get a grasp on the basics so I can say things like, “Hi, my name is Jeana, I like cats and coffee.” Because if you rush ahead and mix up your words, you risk conveying something you didn’t mean at all! That’d be like if I just met you and instead of saying “Hey there, I like cats and coffee,” I said, “Hey there, I like cats in coffee.” Just like you’d go to the effort of being extra studious so you don’t accidentally blurt out something embarrassing in a new language you’re learning, it makes sense to put a ton of effort into learning the proper ATS® moves so you don’t accidentally do a move that throws everyone off. Going back to the concept of levels, I often offer midway sessions – Level 1.5 to bridge Level 1 and Level 2, and Level 2.5 to bridge Level 2 and Level 3 – to help dancers get more practice with the movement vocab of that level before we start throwing a bunch of new moves at you to memorize. As members of FatChance BellyDance® have stated in conversation, we don’t tend to go over moves from a previous level in the current level. So you need to have your Level 1 Shimmy Step down pat before we start telling you how to transition and walk into new positions with it in Level 1.5. THERE IS NO SHAME IN REPEATING A LEVEL. IT’S ALWAYS OKAY TO REPEAT A SESSION AT THE SAME LEVEL, AND IN FACT I ENCOURAGE DANCE STUDENTS TO TAKE A WHOLE SESSION, OR INDIVIDUAL DROP-IN CLASSES, AT A “LOWER” LEVEL THAN THEY NORMALLY DANCE AT. The movements we learn in Level 1 provide the basis for the rest of the moves in the entire dance form, so it’s essential that you can do all the moves properly, since we’ll build on that knowledge in future classes. You need to be able to do these moves not just for yourself, but for your fellow dancers. If you’re not cuing a move correctly, it can mess with everyone else. Again, mistakes happen and we laugh it off and learn from them… but you need to make sure your technique is rock-solid so that you can confidently and happily interact with other dancers. You are building muscle memory that will impact how you perform the moves in improvisational contexts, whether it’s a dance jam at the studio, or an actual performance. Building muscle memory takes time, so it’s a great idea to give your body more time to really learn the moves by lingering in classes of a certain level even when your brain feels okay with the moves. Stage fright is a thing – and one of the best remedies for that “oh crap” moment when you freeze up is repetition and practice! Can you confidently follow all of the moves in that level? Check out the FatChance BellyDance® list of moves by level so you can see which moves you’re responsible for in Level 1, Level 2, and Level 3 classes. Can you competently cue most of the moves in that level? I get it, leading can seem difficult and intimidating… but we all need to start somewhere! I’d like to see students comfortable leading at least half the moves in a given level (but definitely able to follow all of them when someone else is leading them). Can you zil through a fast song if you are in the chorus? Honestly, I used to hate zils, it took me YEARS to get into them. So I’m willing to be a little lenient here. But keep in mind that if you’re curious about performing, you’ll need to work up to being able to zil sooner or later. Keeping all this in mind, let’s go back to the language metaphor. If you’ve just taken your first semester of French or Portuguese, you’re not going to ask to join an advanced conversational class, will you? It might be appropriate to sit in and observe every so often… and you should definitely come to as many coffee hour chats as you can, which I translate in ATS® terms to haflas and dance jams. But if you’re still working on your basic conversational skills – like the ever-so-important ability to order a cup of coffee in your new language – you’re not gonna want to try to read a technical manual just yet. Thanks for reading and please let me know if you have questions. And I have to give a shout-out to the other ATS® Sister Studios and Brother Studios who helped me think through these issues – thanks, y’all! How do you find the classes themselves? I don’t see anything listed. Thanks for letting me know. I was wondering if you have any beginner classes starting in the near future? Hi Lindsey – unfortunately, there are no beginner classes at this time. However, if you drop me a line by email (jeanaj AT gmail DOT com) I can direct you to my troupemates who are running practices in my absence until early June, and these might be suitable for you.